If you're a fan of the exotic, delicious, and irresistible flavors of India, then you must be familiar with roti. For those of you who are still new at Indian cuisine, roti is a delicious tortilla-like bread that has a crispy outside texture and a soft center. The flour based dough is carefully rolled, then placed on a tawa, a flat cast iron pan, and cooked until the dough balloons up. So, how do you make this at home? 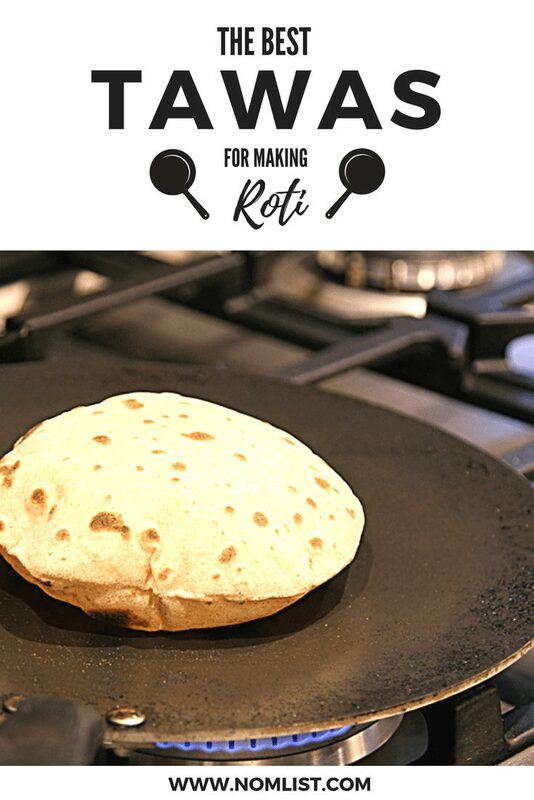 We did the research for you and found the some of the best tawa for making roti in the comfort of your own home! Generally, tawas come in sizes from 8" diameters to 16" diameters. If you're planning on making smaller sized rotis or only feeding yourself, you can go with an 8" size. However, if you plan on delving into other Indian breads, you may want to get a 16", especially if you have a bigger family. Since tawas must be relatively thin in order to cook the roti evenly on all sides, the material will be something along the lines of aluminum. If you want to splurge a little more, go with a cast iron material. 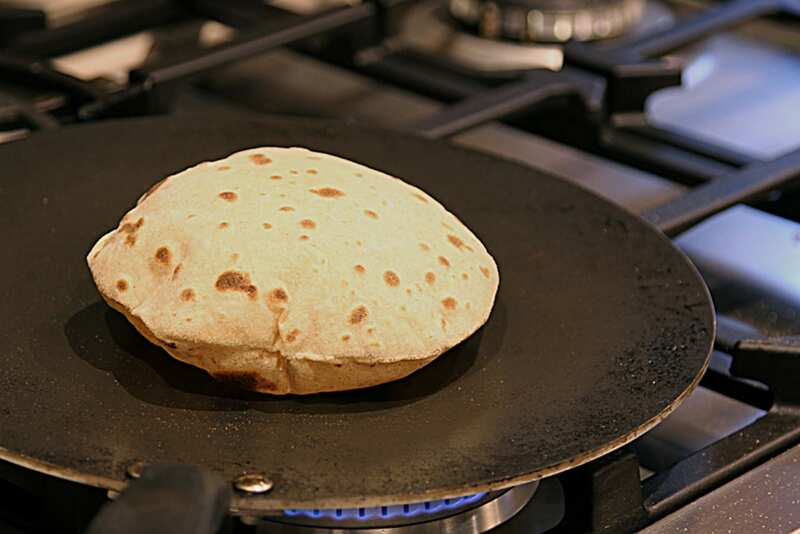 If you want your rotis to pop-up in one beautiful piece, you may want to get a non-stick tawa. However, some people are able to get incredible results using ghee to keep the roti from sticking to the pan when cooking. The material of the handle can make a difference when cooking. Look for something that is comfortable for you. If your hands are a little stronger and you are more experienced in the kitchen, this may not make too much of a difference. If you're looking for a tawa that will truly get the job done, then this is the one for you. This gorgeous pan is one of the best quality tawas available on the market, and for a good reason. Coming in with a diameter of 13 inches, this tawa can make all kinds of rotis, from small to large, to feed your entire family. Also, if you feel like you want to explore other Indian breads, this tawa works really well for large dosas and even crepes! The super thin aluminum construction is coated with a non-stick surface, so you don't have to worry about scraping your rotis off the pan. Plus, there's a fun manual how to use the pan included for beginners. Overall, this is one of the best tawa for making rotis on the market. Beginners to advance cooks will find this to be useful in their kitchen arsenal. Want a sushi mold that's perfect for Oshizushi style traditional sushi? This is the mold you NEED for your kitchen arsenal. This mold is handcrafted in Japan by professional artisans with years of experience. Made from high quality bamboo, this box is sturdy, waterproof, and will last you a lifetime of sushi making. If you want to up your Osaka flavors, you can create some of the best pressed sushi with this mold. If you want to create sushi the way that traditional Japanese sushi chefs do in Osaka, you must get this sushi mold. We guarantee you will be pleased with it's high quality and workability. Have you ever had delicious musubi? Ever wonder how the Japanese made their cute rice balls in a perfect triangle? If you're not the type with the best dexterity, this is the perfect sushi making tool for you. Made from sturdy plastic, these molds work really well for making rice balls. Simply add the dried nori around the edges, fill the mold with rice, and fill the center with your favorite meats and vegetables. It makes the perfect snack on the go our at home. By far, this is one of the most convenient tools to have in your kitchen for sushi lovers. If you're a fan of rice, vegetables, and meat, this is your best bet! Want to make lunchtime adorable, cute, and simultaneously delicious? This fantastic panda sushi mold is the perfect addition to lunch-making. The kit includes 1 panda face shaped rice mold with nori puncher, 1 set of 4 sushi shapers (heart, star, triangle and flower). In our opinion, it's the best bang for your buck. Plus, you get adorable panda shaped sushi out of it. Inspire a little creativity in your family while making sushi. Overall, we think this adorable addition will be perfect for your future dinners and bento boxes. What's cuter than Rilakkuma sushi? NOTHING! Now, you can have your own Rilakkuma shaped sushi balls made from your kitchen. That's right, these adorable molds allow you to make cute sushi in seconds. This sushi making kit comes with all the goodies you need to make the rice balls. Inside, it has a nori puncher to get the cute face accents on your rice balls. Plus, it comes with the rice molds that perfectly shape your Rilakkuma heads. In the end, we know you're going to have a blast making sushi with these cute Rilakumma sushi rice ball molds. It's perfect for a solo mission or the whole family. Alright, we spoke too soon in the earlier post. This Hello Kitty sushi mold kit might have to top the charts on the cutest sushi mold kit of all time. We love all the pinks and reds and, of course, our favorite Japanese character. This amazing pack includes 1x Food Forks, 1x Sushi Roll Mold, 1x Rice ball Mold & 1x Rice Paddle. All you need to add is a rice maker, nori, and a few of your favorite sushi fillings. Your kids will love it, and you may even want to pack away a few for an afternoon snack! All in all, these Hello Kitty sushi molds are absolutely adorable. It makes a great gift, and don't forget to get one for yourself as well!